The Arenui began life in July 2007. 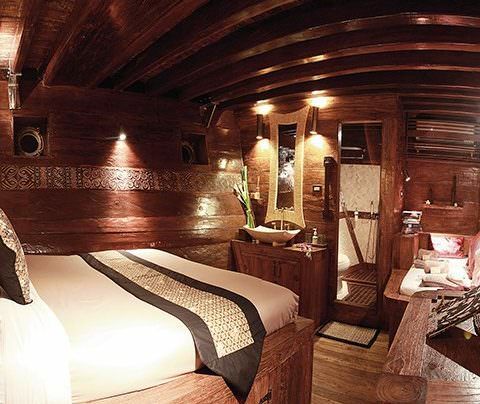 The main hull was crafted from ironwood by over 50 local craftsmen in South Sulawesi. 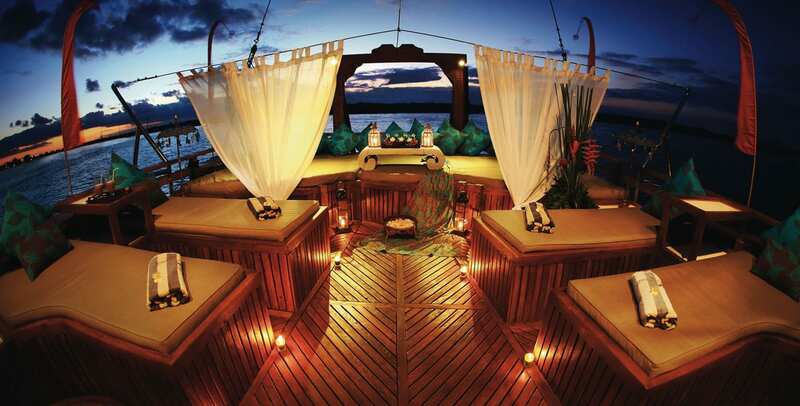 The structure of the boat was completed in Java and Bali. We are pleased to announce that 70 percent of the wood used to build the Arenui is recycled wood. 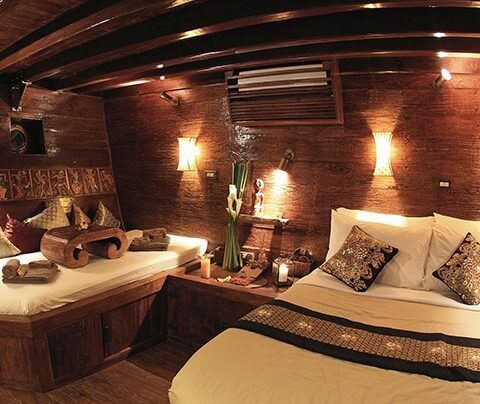 Many parts of the boat are made from recycled teak wood from Javanese houses. 14 different types of wood have been used in the crafting of the Arenui. 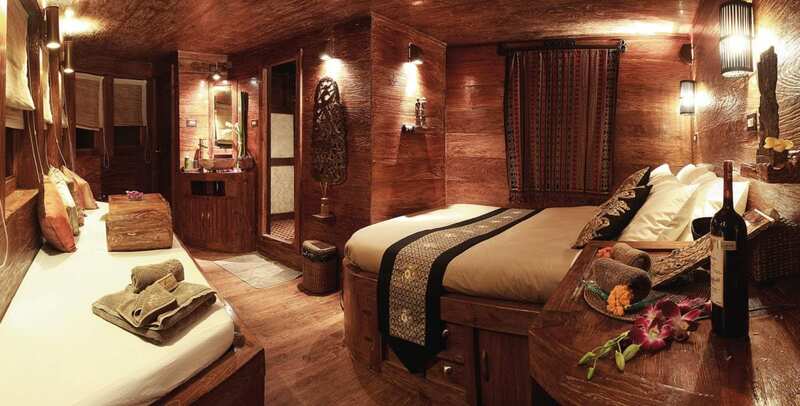 The hull is made up of 7 types of wood and the interior uses 7 types of wood. 17 different types of finishing techniques have been used. All wood finishing has been done by hand, using traditional materials and techniques. The bronze, brass and copper features, such as the unique hinges and handles are all handmade. Most of the lamps are made from copper or brass and were handcrafted in Java. The portholes are made from bronze. We have taken some traditional elements of Javanese houses and recreated them on the Arenui. 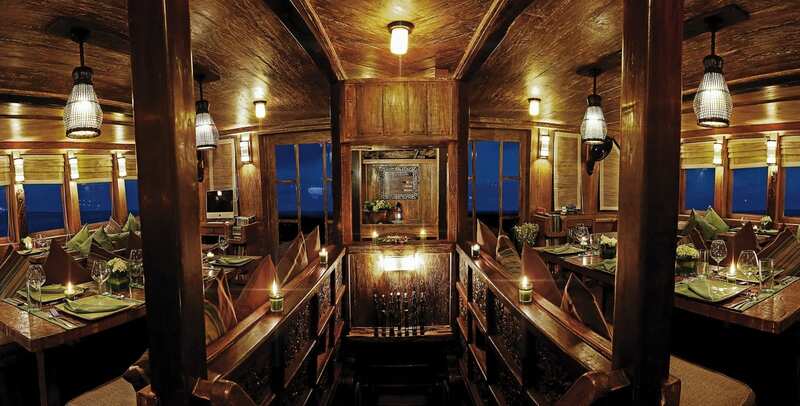 The steps in front of the restaurant, for crew access to the top deck, are from a Javanese house. Triangular supports with intricate carvings can be found all around the boat. The boon support in the sky lounge area was hand crafted in Bali, designed to look like a typical Balinese doorway. Take a look at the intricate carvings on the stairs from the restaurant down to the lower cabins. These locally carved wood panels depict the Ramayana story. Ramayana is an important part of Hindu faith. It is an epic poem of courage, magic and humour, containing 18 books and 24,000 verses divided into 500 songs. 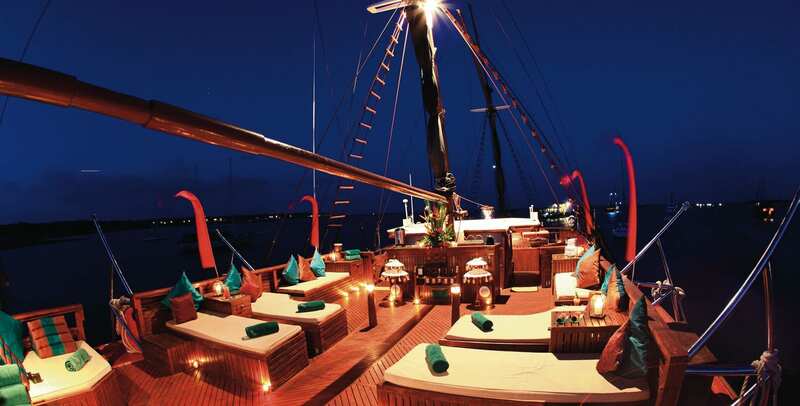 The Arenui is a traditional and magnificent Phinisi – a classic Indonesian wooden sailing vessel – set to explore the majestic underwater world of the Indonesian archipelago. 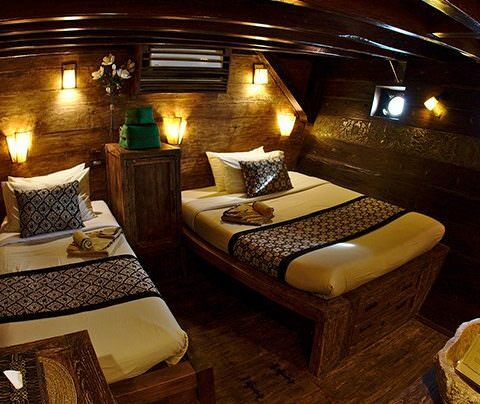 If you’ve dreamed of setting sail aboard an old-fashioned pirate ship (but with all mod-cons) then this is for you. If you want to experience the culture and style of the country, as you sail through its beautiful islands, then this if for you. Unlike modern-style vessels, we offer you the chance to step aboard a truly Indonesian experience, to enhance your time in this special destination. 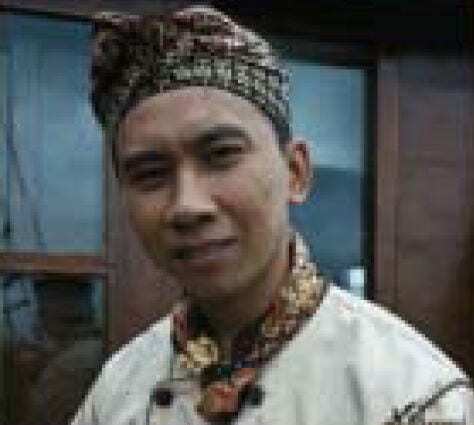 Our main objective, in creating the Arenui, was to provide something unique and special for our guests, which promoted all the very best elements of Indonesia’s rich heritage and traditions. 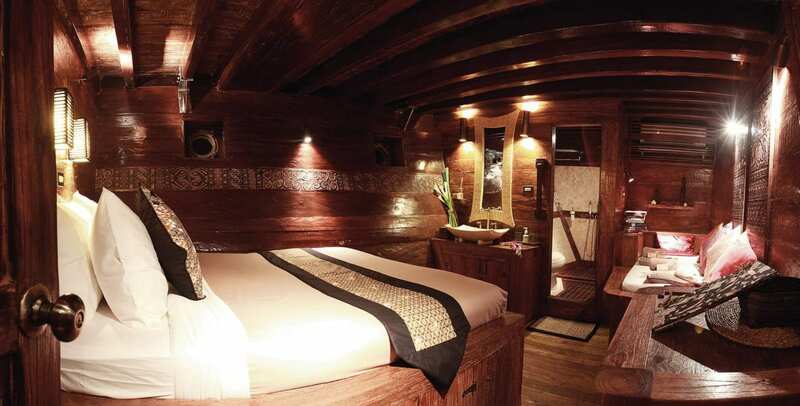 This is reflected in both the design and decor of the boat, from the local craftsmanship to the use of antique pieces and original wooden panels. In addition, we wanted to reflect our connection to our environment, since this industry will only survive if we care for the world and ocean around us. With this in mind, we used as much recycled and reclaimed material as possible. We applied long-term vision to the layout and features, to ensure that the boat remains in good working condition for many years to come. Our guests’ safety and comfort were paramount when creating the Arenui structure and layout. We chose just 2 decks – and a higher draft than most other Phinisi – to maximize stability and avoid rolling in rough seas. We also wanted to maximize flexibility in terms of rooms, so we created an unconventional layout to offer larger cabins, a larger restaurant, a large outdoor area (sky restaurant, sky lounge and dive deck), a roomy wheelhouse for the captain (and guests keen to take part), as well as a very large area for our invaluable crew (22 beds in the crew quarters with extra space for our cruise directors who work so tirelessly on our operations). To accommodate these spacious rooms we minimized the corridor space and created a compact galley with innovative storage areas. We also chose the stern of the vessel for the ‘working’ area, so the tenders and diving equipment can be prepared easily without disturbing guests. The restaurant area is also unique, stretching across the full width of the vessel to allow for maximum seating and space, so guests can spread out and have a choice of places to sit. Altering the layout on this deck would have compromised this impressive restaurant space, so we felt this should be our priority. 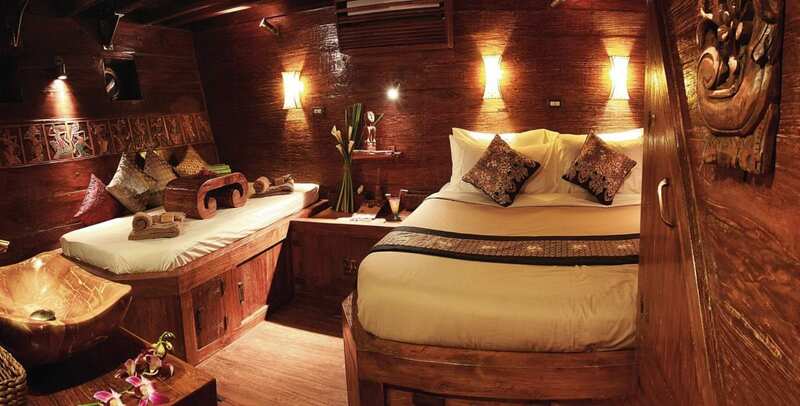 The upper deck features 2 master-suites (Rama and Shinta, double beds) and 2 deluxe twin cabins (Barong and Ganesh, single beds), plus the galley, the dive deck and the spacious restaurant. 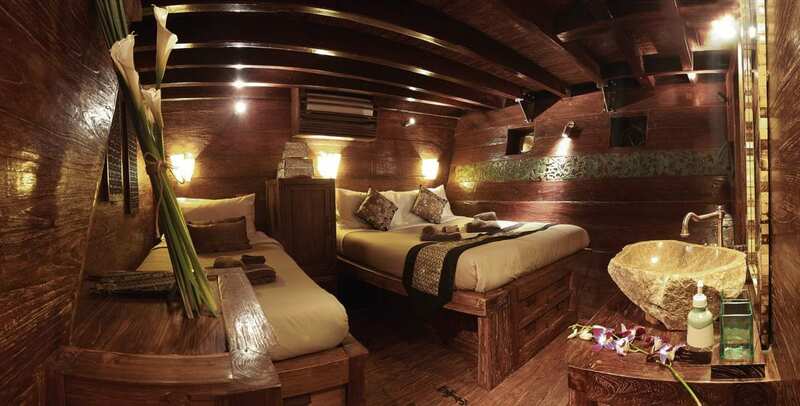 On the lower deck we have 4 deluxe cabins (Garuda, Legong, Toraja and Dayak), accommodating couples, single divers or groups of 3 (e.g. families with children). On the skydeck you’ll find the sky restaurant and sun-bathing, the wheelhouse and then the raised sky lounge with stretches across the back half of the boat. Safety is a top priority on the Arenui. All precautions have been taken to ensure that the Arenui fully complies with current international safety standards. The Arenui is dry docked every year so that the hull can be stripped and repainted while the main engine and generators are fully serviced. In addition, the vessel frequently receives additional maintenance as part of its regular daily operations. All of this is to make certain that the highest standards of reliability and safety are met. We consider your security and safety while on board our priority. This includes providing an efficient crew, led by a qualified captain with experience on domestic and western cruise ships, and the most up-to-date navigational and safety equipment. The Arenui has been designed to host a maximum of 16 passengers in 8 exceptionally spacious cabins (starting from 19 squared meters). 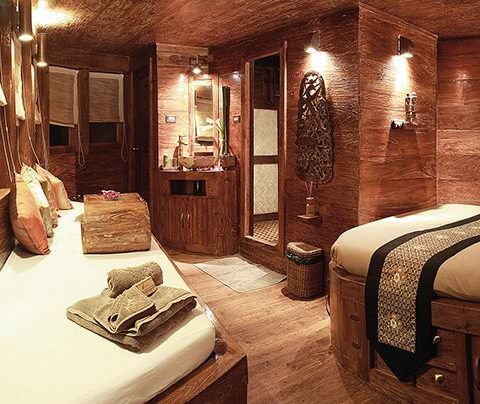 All cabins have been luxuriously furnished in a sophisticated and tasteful manner. 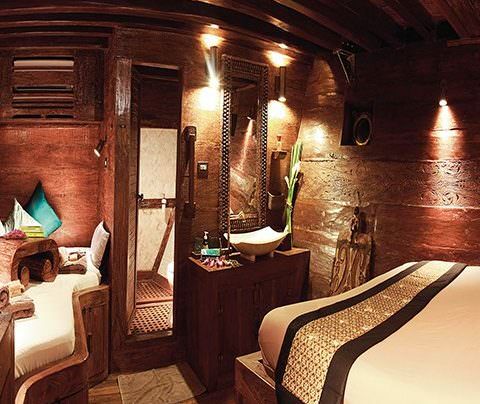 The cabins’ individual themes and styles were inspired by handicrafts from each of the Indonesian provinces. 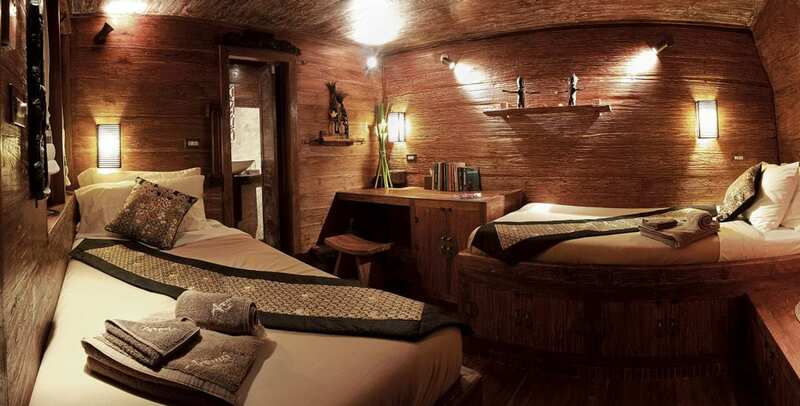 Each cabin has a private en-suite bathroom and individual air conditioning. A king-size bed or roomy singles and a distinct lounge area guarantee maximum comfort and ensure that our guests never feel crowded. The Arenui can be your private sanctuary and second home, but one located amidst a constantly changing tropical landscape! Ideal for couples looking for something extra special, with stunning sea-view. 20 sq metres, king-size bed, sofa/relax area, en-suite bathroom, 7 large windows, private balcony with seating, individual air conditioning, minibar and safety deposit box. Special array of handicrafts and textiles from Bali, West Papua and Central Java. Cabin named after a main character in the Hindu epic, Ramayana. Special array of handicrafts and textiles from Bali, West Papua and Sumba. 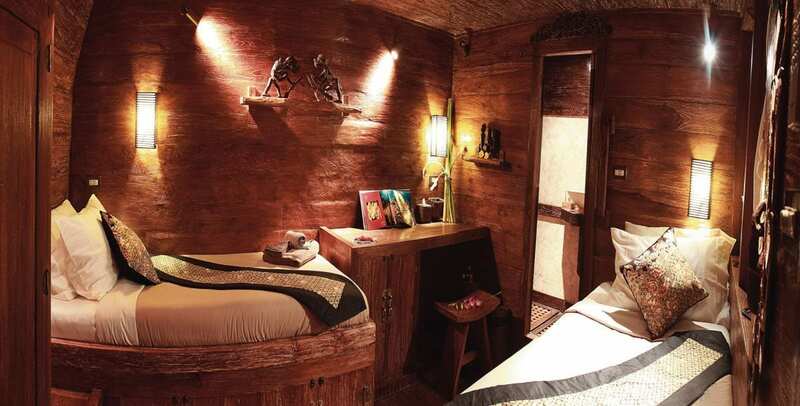 Cabin named after a main character in the Hindu epic, Ramayana. Ideal for individuals. 19 sq metres, 2 single beds, spacious desk (popular with photographers), en-suite bathroom, 2 large windows, individual air conditioning, minibar and safety deposit box. Special array of handicrafts and textiles from Flores West Papua and East Java. 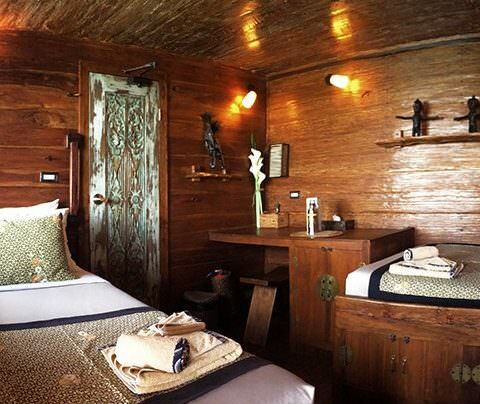 Cabin named after the King of spirits, leader of the forces of good and enemy to the demon Queen in Balinese mythology. Special array of handicrafts and textiles from Maluku, Cendrawasih Bay and East Java. 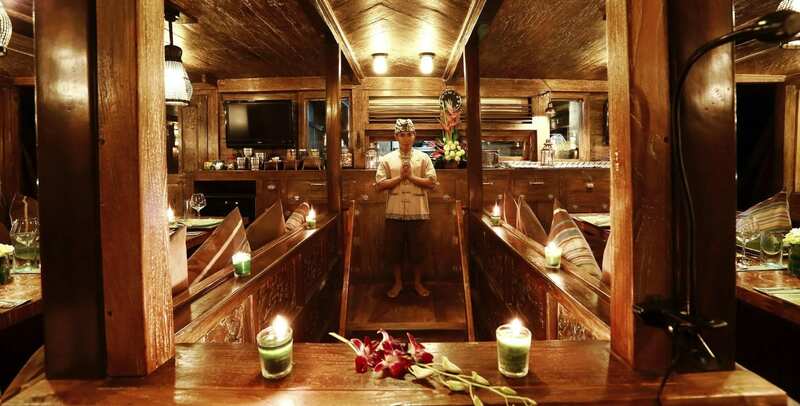 Cabin named after Hindu’s most beloved deity, the god of wisdom, scribes, learning and the remover of obstacles – a prayer to Ganesh is said to ensure success. Suitable for couples, individuals or a family (single bed available). 21 sq metres, king-size bed, 1 single-bed, en-suite bathroom, 3 large portholes, individual air conditioning, minibar and safety deposit box. Special array of handicrafts and textiles from Flores, West Papua and Java, with a special Balinese motif carved on the wall. Cabin named after a classical dance, usually staged in the palace courtyard to entertain the King. Suitable for couples, individuals or a family (single bed available). 20 sq metres, queen-size bed, 1 single-bed, en-suite bathroom, 3 large portholes, individual air conditioning, minibar and safety deposit box. Special array of handicrafts and textiles from Bali, with a hand-woven silk stole from Central Sulawesi. 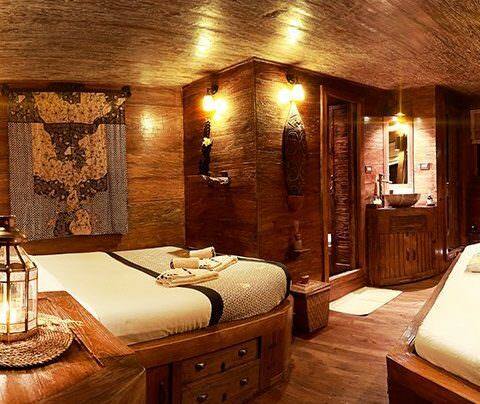 Cabin named after a large mythical bird-like creature found in both Hindu and Buddhist mythology, and also the national symbol of Indonesia. Suitable for couples or a family (sofa can be converted into an extra bed for a child). 20 sq metres, king-size bed, sofa/relax area, en-suite bathroom, 3 large portholes, individual air conditioning, minibar and safety deposit box. Special array of handicrafts and textiles from Sulawesi, Central Bali and Flores. 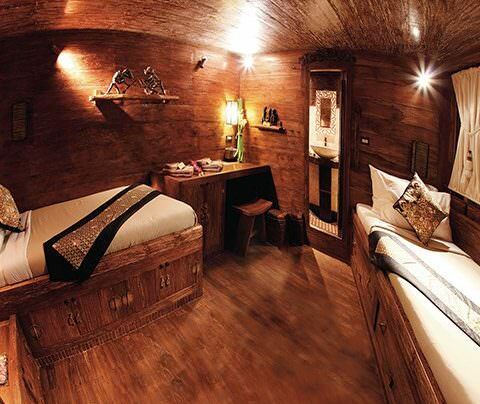 Cabin named after an ethnic group indigenous to a mountainous region of South Sulawesi. Suitable for couples or a family (sofa can be converted into an extra bed for a child). 21 sq metres, king-size bed, sofa/relax area, en-suite bathroom, 3 large portholes, individual air conditioning, minibar and safety deposit box. Special array of handicrafts and textiles from Kalimantan and West Papua. Cabin named after a people indigenous to Borneo, including the Dayak Bukit ethnic group from South Kalimantan – the Indonesian part of the island of Borneo. One of the key features of the Arenui is our expansive restaurant and lounge area, which takes up the central space on the main deck and reaches across the full width of the vessel. 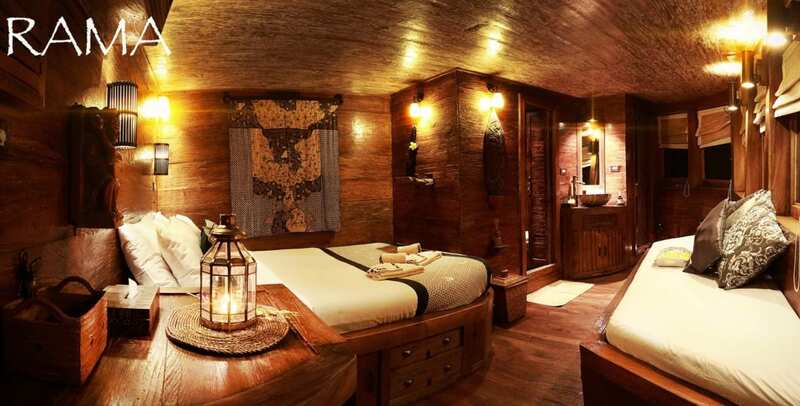 The design is not only practical – to offer the most relaxing environment for our guests, but also decorative – in keeping with the traditional Indonesian theme of the boat. At one end we have a large counter for our buffets and snack items, as well as tea and coffee facilities. Below this you’ll find well-stocked wine fridges, as well as cold soft drinks and juices. Above the counter are 2 LCD screens for showing movies, slideshows and also displaying dive briefings. Make sure you look behind the counter to say hello to our hard-working chefs in the gallery, as they prepare your next delicious meal. 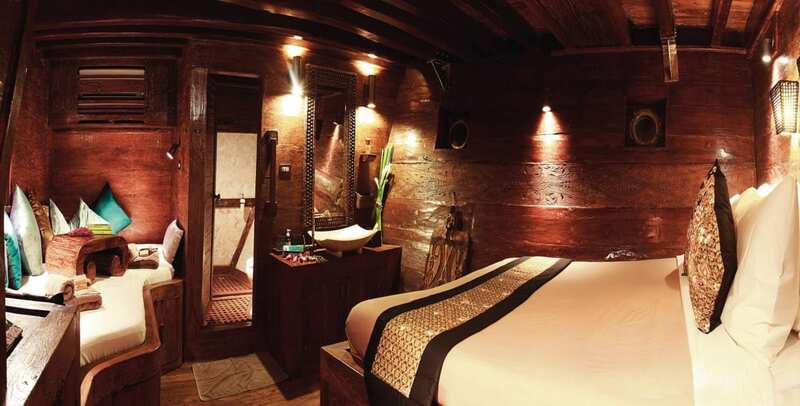 In the centre is a wooden stairwell leading down to the lower deck cabins, featuring an exquisite locally-crafted panel depicting the traditional Ramayana story. Either side of this you’ll find long tables, each designed to accommodate 6 to 8 guests comfortably. With an open bench on one side, this design allows freedom of movement for guests. 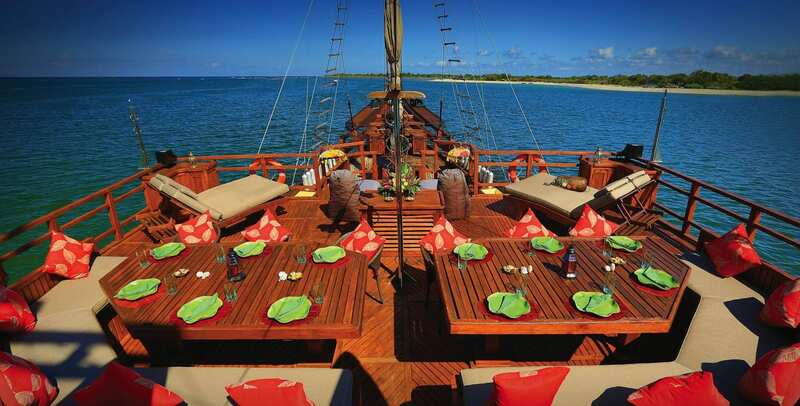 It avoids the usual problem on liveaboards, where a row of diners get stuck in the middle of the bench and can’t easily move without disturbing other diners. Opposite the long tables, again on both sides, are 2 smaller tables – ideal for couples – with uninterrupted views out across the ocean. 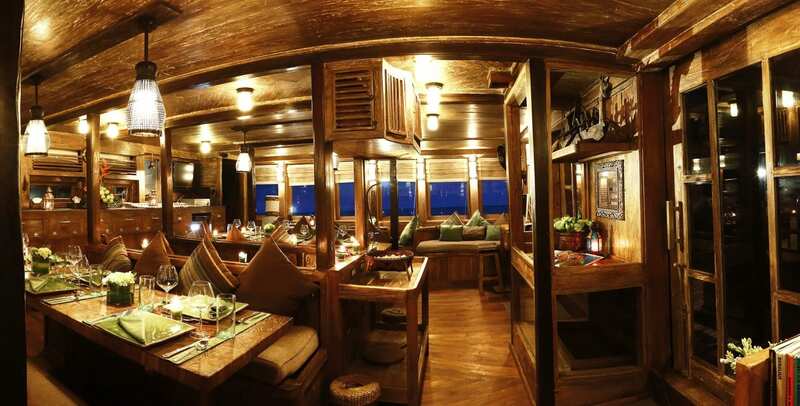 The windows are a key feature, that run along the full length of the room on both sides, offering not only great light throughout the day but also panoramic views of the Indonesian islands as we sail through the picturesque landscapes. At the front end we have 2 over-sized, curved sofas – one in each corner. With a table in front they are ideal for 2 or 3 diners, or a group of divers writing up log-books, or a relaxing place for flicking through photos on your laptop, or just a spacious day-bed for reclining with a book or a movie. In addition, there is an iMac workstation (equipped with both windows and mac operating systems and software), 2 charging stations with shelves for storing your equipment and the entire space is kept at a comfortable temperature with 3 air-con units and 2 swinging fans. 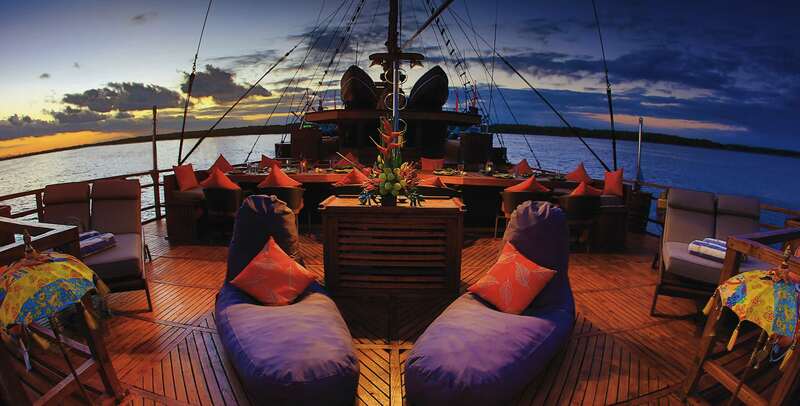 The Arenui has 3 main outdoor areas, including the largest deck you’re likely to find on an Indonesian liveaboard. Our primary concern, when designing the outdoor spaces, was our guests’ safety and comfort. The walkways are well equipped with hand-rails and the open spaces are uncluttered to make it easy to move around. The dive deck is in front of the restaurant, on the main deck. As wide as the boat, this area has plenty of space for guests to kit-up together for a dive and also store personal dive equipment. Along the two edges are wooden counters for camera equipment, with drawers below for pelican cases, masks, snorkels, rash-guards, SMBs and other small items, plus 2 rinse tanks. In the centre we have a comfortable sofa bench, which makes the wetsuit dance considerably easier. There is a large area for hanging items to dry - although crew members will wash and hang your wetsuit or rash-guard for you, after every dive. There is also a canopy for shade. The sky restaurant, on the upper deck above the indoor restaurant, is a perfect place for al fresco meals and watching the changing landscapes. We have 2 large tables in the centre, which can accommodate up to 20 people. At the front we have 2 special, ``double`` sun-beds - space enough for 4 guests to sun bathe or just relax in the evening. We have a telescope for those keen on a session of star-gazing, and don't forget our 2 large antique spotlights which were salvaged in Jakarta from an old, sunken French ship. The area has a moveable canopy for shade. Behind the sky restaurant is the sky lounge - a favourite spot with most guests. In addition to an outdoor shower for cooling off and a wooden bar for drinks, the area features day-beds and benches all fitted with high-quality, thick mattresses (20+ cm) for ultimate comfort. Relax up here with a book or some music, chat with fellow guests or get an outdoor massage. There are spaces open to the elements for the sun-lovers among you but also a large canopy for shade. We are proud and pleased to have one of the finest crews in Indonesia. With 23 crew serving a maximum of 16 guests, we aim to make your cruise a truly relaxing and first-class experience. Our 4 Indonesian divemasters (Ronald, Fery, Hery and Fahmi) are rated amongst the most knowledgeable in the region, our 2 main chefs (Putu and Ketut) are arguably the most famous liveaboard chefs in Indonesia, and the whole operation is led by our 3 highly experienced western cruise directors (Guillem, Lisa and Kai), supported by our marine biologist Jose. Rest assured that besides our very experienced divemasters, chefs and cruise directors, we have a further 15 well-trained crew members onboard from captains and engineers to masseurs and stewards. Most of the crew have vast experience working on other liveaboards operating in the area but, prior to the Arenui’s very first cruise, every member of staff was trained so their skill and performance would meet our high standard of operation. Cruise Director Guillem, (short for Guillem), from Spain discovered his passion for diving in Egypt and this is where he took his PADI Divemaster course. 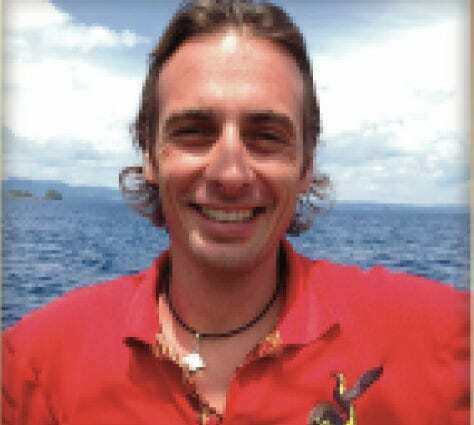 While travelling the world for one year G became a diving instructor in Honduras. Since then he has worked in Honduras and Egypt and Indonesia for the last two years. G has a boat license and a great understanding of the sea. Cruise Director Lisa, from Germany trained as a lawyer and worked as a professional translater. 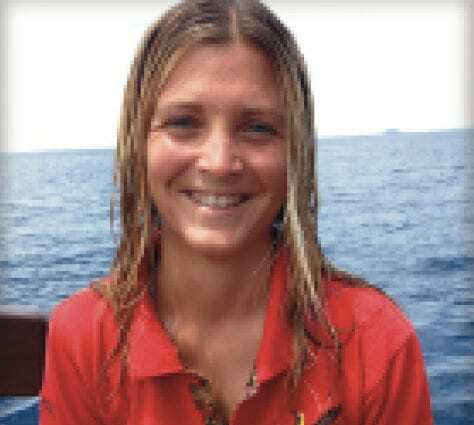 She also fell in love with diving in Egypt when she went on her first liveaboard. Lisa is a nature and ocean lover with a commitment to protect the environment and the marine life. 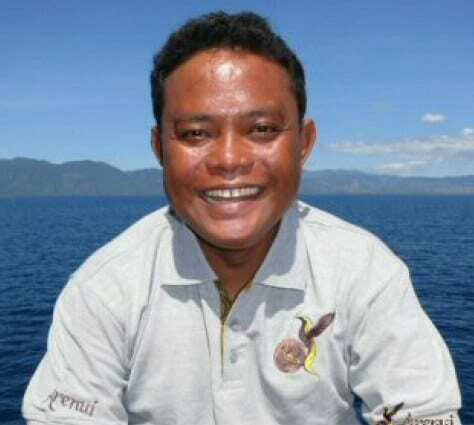 Divemaster Ronald has been diving since 1997 and was guiding in Lembeh Strait (North Sulawesi) for 16 years – so his experience finding critters in Lembeh means his guests are sure to see lots of hidden delights, plus he enjoys guiding photographers and pointing out photogenic subjects. 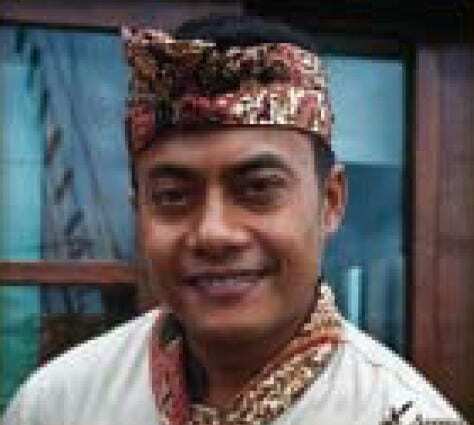 Chefs Putu and Ketut are both highly sought-after experts, well trained and experienced in a moving kitchen. They relish the challenge of serving a different menu every day and have extremely high standards of cleanliness and organization – essential to a limited liveaboard galley. Their menus feature a range of influences from Indonesian, Thai, Chinese and Indian to Mexican, Italian and French, with fantastic fish and steak dishes but also handmade pasta, and fresh handmade croissants and bread every morning.